When people hear the term “Urban Wildlife” they aren’t talking about a crazy party in the suburbs. Urban wildlife refers to non-domestic animals that are forced (or choose) to live in and share our environment with us, whether we like it or not. Oh, they’re cute enough and in most cases their species was there long before we were, but they can pose threats that aren’t always obvious at first. 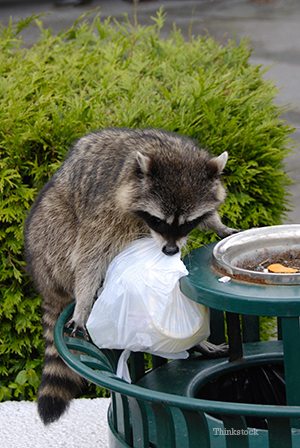 Raccoons: While they’re cute and entertaining, they’re often curious and seem to love dog and cat food. They have a habit of finding their way under and into houses and can be very hard to eliminate. 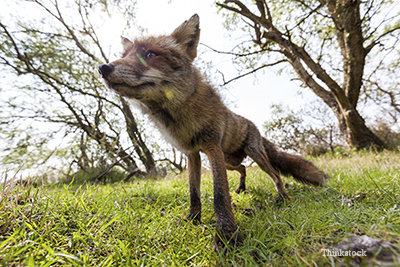 Foxes: Though foxes often avoid people, you may have seen a few passing through the yard. Skunks: Even with their unpleasant odor, nothing beats a baby skunk for cute factor. Coyotes: Increasingly, coyotes are returning to their natural habitat and beyond. Coyotes are commonly seen in metropolitan areas and city parks! What diseases do these wild animals carry? Rabies is undoubtedly the most frightening and deadly disease carried by wildlife. It’s transmitted in the saliva of infected animals, primarily by bites. The primary carriers vary by region, but if you have raccoons, foxes, skunks, coyotes or bats in your yard, there is a potential risk of exposure to you and your pets. There have been rare and sporadic cases in skunks and even rabbits, but they represent much less risk. Leptospirosis is a serious bacterial disease that is increasing in frequency of infections, even in urban areas. It is transmitted in the urine of the animals we’ve discussed so it can contaminate areas of standing water, ponds, bird baths and fountains where our pets might drink and be infected. Prevention: Leptospirosis is largely preventable through vaccination. Be certain that if your dog is at risk, you have him or her vaccinated by your veterinarian. Heartworms are a deadly parasite of dogs and less commonly of cats. They’re transmitted by many species of mosquitoes. Many raccoons and coyotes are infected with heartworms. Prevention: Because they’re transmitted by mosquitoes, controlling wildlife doesn’t do much in terms of prevention. Be sure that your pets are on heartworm preventive all year round. Baylisascaris, an intestinal parasite, infects raccoons. It can cause devastating disease in people as well. Other intestinal parasites are also very common in wildlife and can contaminate soil in your yard and infect your family. Prevention: Control raccoons in your yard. Trypanosoma cruzi is carried by the opossum and is actually the only disease they carry. It’s transmitted by an insect called the kissing bug or by direct exposure to the blood of an infected opossum. Prevention: Control opossum in your yard. What else can wildlife bring into my environment? Much, if not all, urban wildlife and feral animals are tick and flea infested. They can rapidly infest the environment with these pests and there is a very real risk of you and your pet being exposed to tick and flea transmitted diseases. It’s impossible to control these parasites on wildlife so do not allow critters to take over your yard. Prevent the preventable by making sure that your pets are vaccinated against rabies and, if indicated, Lyme disease and leptospirosis. Make sure you follow your veterinarian’s recommendations to prevent and control heartworms, intestinal parasites, fleas and ticks. The only way we can reduce our exposure to these animals is to make our yards less desirable. Fence the perimeter of your yard when possible and close off access to attics, crawl spaces and areas where they might nest. Most importantly of all, do not feed them anything, ever. Feeding them makes your yard a desirable spot. Not feeding them will make it less desirable.